Accommodation in Rome. domusamor.it. DomusAmor Navona.B&B Best Choice in Rome. 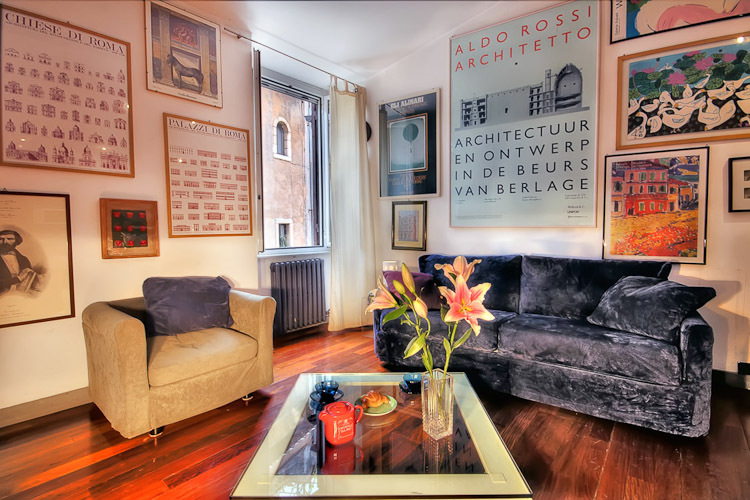 Just around the corner from Piazza Navona, this apartment is placed in the heart of both ancient and modern Rome. This fascinating area has its name from Pallaro, a game played in Old Rome, not unlike today's lotto. Underneath the apartment building lies the ruins of the Theatre of Pompey, built between year 61 and 55 b.c., where Julius Caesar was assassinated in year 44 b.c. Situated on the third floor, with no lift, the apartment overlooks a typical Italian largo - a small square. Right outside the sitting room window is the magnificent dome of the baroque church Sant'Andrea della Valle, almost close to enough to touch. The apartment is furnished to obtain a modern and elegant style, made unique and personal with a tasteful choice of prints and paintings. Central, yet private, this is a true hideaway for anyone who wants to enjoy an urban holiday in a relaxing atmosphere. There are several restaurants and small taverns in the small streets surrounding Largo del Pallaro, offering excellent traditional Roman and Italian dishes. The combination of Italian cuisine, the incomparable beauty of the surrounding buildings, the historic venues and the warm atmosphere of modern Rome makes a visit here second to none - a complete experience for all senses. My name is Carlo, I come from Rome and I have run the business Domus amoR Bed & Breakfast and apartments since 2000. My associates and I look forward to welcoming you and we will do our best to make your visit in Rome a memorable one. Accommodation in Rome. domusamor.it. DomusAmor Colosseo. Best Choice in Rome. Iscrizione dipartimento turismo comune di Roma n. 494.